Can Press-On Nails EVER Look Natural? Back in my university years, a big night out wasn't complete without a set of press-on nails. You know the kind right? The poor gal's gel nails. Sure there are some positives to press-on nails. You don't need to pay big bucks as you would at a salon. You don't need to head back to said salon if a nail comes loose. There's also no UV exposure. Heading to local chemist, hmming and ahhing over garish colours before settling on...French Tips. Trying to size match the fake nails to my own odd shaped nails. Settling for 'that'll have to do' on at least 3 nails. Applying the sort-of size matched nails using the world's runniest glue. Trying not to flick off nails while handling money or trying to get my ID from my wallet. Waking up the next day to find several nails missing and the remaining ones hanging on for dear life. Spending the next week picking off glue remnants and promising my nails I will never do it to them again. Is it really worth going through all of that, just to rock an unnatural looking set of plastic nails?! Well, guess what? Times have changed. YES. We are entering a new era of false nails. Imagine if you will, press on nails that are high quality and have a UV Gel finish, making them durable and chip resistant. Then imagine the non-damaging glue can be applied in two ways - to allow for long (10+ days) or short (1- 3 days) wear. You can even re-use the nails if you've used them for a shorter period! But do these nails look good? Do they look natural? Check 'em out for yourself. Teddy Lane is the nail phenonemon sweeping New Zealand. Teddy Lane is a gorgeous NZ company owned by a mother and daughter. 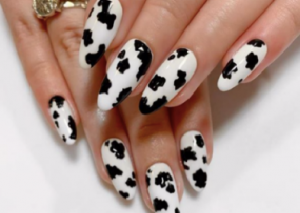 Their cruelty-free and Vegan friendly nails are available in so many beautiful designs - from neutral tones, to catwalk trends, and everything in between. There's even a variety of lengths and shapes to choose from! Each set contains 24 (TWENTY-FOUR!!) nails in 12 sizes, covering large, average and petite nail sizes. Of course we're going to be putting Teddy Lane to the test. And here's the super exciting part - the reviewers on this trial team can choose what Teddy Lane design they'd love to trial! Click here and head over to the Teddy Lane website and get browsing! When you've found your favourite design comment below and let us know what it is. If we pick you - you'll receive a full set in your chosen design to review! Yes, some brands have nailed it, I'm sure. No way - they always look cheap and nasty! These are really pretty! They look like salon done gel nails so I would be so interested to try. I love the look of the glamour collection - especially the Manhattan! So fun but also classy. I have never heard of these! Can't wait to see what people think of them! My short, brittle nails need help! I think I really like the natural, Belle style - an everyday classic! Love the look of sparkling grape. They look lovely but not sure if I will be sold on stick-on nails after working as a nail tech for years before having kids. Things have changed so maybe! These are fab looking, Amethyst, Catwalk and Golden Knight are all going on my need to buy list. Can't wait to see how these review, because I am so lazy when it comes to nail polish. Never worn press-on nails but these look funky cool. Love the love lace and the doris plum designs. Wow these actually look gorgeous! I have never tried stick on nails but I probably should because my natural nails are a mess and these would be a good way of covering them up without going to a salon and needing acrylics! I looove the look of the Belle nails from the Classic Collection, they look so gorgeous and so natural! These look stunning! I find it hard to believe that they are as good as they look as stick on nails scream barbie ones for my daughters lol. I usually use nail polish, gels, jamberries and acrylics so I am very keen to see how they stack up. I would lovw to try heavenly. Each of these designs look stunning, however my favourite is the Manhattan. I can’t believe how far press on nails have come! I remember trying a hideous pair when I was little and haven’t touched any since. These beauties have changed my mind. Now I need to re-try press-ons. I would love Blue Mango from the matte collection. The marble effect is so cool! These nails look great - hope they deliver on what they claim. Venetian looks great.